While I am desperately praying for the sun to come out in a grey and freezing London, I understand more than ever why praying to the Sun has always been such an important part of Hinduism. The sun is essential not just for life but for our general well-being too. The Sun enjoys a special place in the Hindu pantheon and is one of the five main deities that are meant to be worshiped daily . It is the only pratyaksha Brahman, the only deity that can be seen with the naked eye. Several hymns from the Rig Veda, invoking the Sun, are chanted as a daily ritual in many hindu households even today. I need this one today…. ‘The Sun Lord is auspicious and bestows auspiciousness. I am sure all of us, in places further away from the equator, can identify with the above hymn. We know what a little bit of sun can do to lift our spirits and how much the lack of it can weigh us down. It is a well accepted fact that people living in warmer places tend to be happier. The ancient seers obviously knew what they were talking about. Furthermore ,they understood the impact the sun has not just on us, but the earth as well. One poem states- ‘at his command even the waters are still, even this wind comes to rest in its circling’ Science tells us today that all weather changes are caused by the Sun. They saw him as the mover of the solar system and the prime source of Agni ( fire) . In the earliest poems, the sun is worshipped as Agni itself, the Universal Fire. 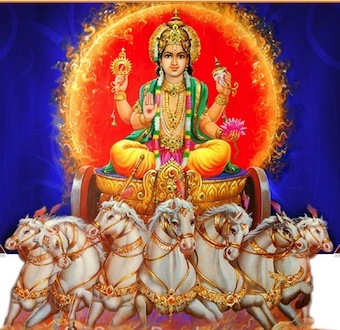 Later on he is depicted as Surya, the Sun Lord, riding a golden chariot pulled by seven white horses. Savitar (Sun) has created a boon worthy of holy song. The Gayatri Mantra, the most important of all mantras, also from the Rig Veda, worships the sun not just as the giver of physical light but also spiritual light. The Rig Veda, the oldest of the vedas is full of songs in praise of not just the sun but the moon, the planets, the wind, thunder and lightning, the ocean,the rivers, trees and rocks. It is an expression of a people in awe of the world around them and I think it is the forgotten core of Hinduism. The rituals came later when the elements were enshrined as deities. Perhaps the rituals were just an elaborate ways of preserving that sense of awe and reverence. Worshipping nature is not a primitive or superstitious act. It is a recognition of the wonder of nature, a respect for its forces which cannot be controlled and an understanding that we cannot exist without it . Unfortunately, today we seem to be lost in the rituals alone. How wonderful it would be if every time a prayer was chanted, we could pause to ‘listen’ and look around us with the same sense of awe as our ancestors and see this amazing blessing that is Nature. I hope in revering it with our prayers we may learn to treat it well and preserve it better.